The University of Southampton's Fund for the Greatest Need provides matched funding opportunities for academic priorities focused on advancing research, enterprise and innovation. We are the Southampton University Spaceflight Society, a student society for those interested in space and other related fields. Over the years we have undertaken several ambitious projects such as developing a cubesat with the University. Other society projects include: Lander Project, Inertial Measurement Unit, UKSEDS rocket competition, Stabilised Platform, Lunar Hopper and a Liquid Propellant motor (further information on all of these projects can be found here ). We also have outreach programs at local schools, getting kids interested in space, science and engineering from an early age. This new project hopes to push the boundaries of our society's achievements and provide further inspiration for future generations of engineers and scientists. Okay, what exactly is “Dodge this, Roadrunner!”? "Dodge this, Roadrunner" is an exciting new project in which we are designing and building a hybrid rocket with a thrust of 4000 N, using a solid fuel (Nylon – 6) and liquid oxidizer (Nitrous Oxide). If successful, the rocket will break the British altitude record for amateur rockets. While the current record is 10,303 m achieved in the year 2000, our rocket will hopefully reach an altitude of approximately 20,000 m, higher than any commercial aircraft can fly. It will carry two on-board cameras (one Earth-facing and the other pointing towards the horizon) to film its record-breaking voyage. 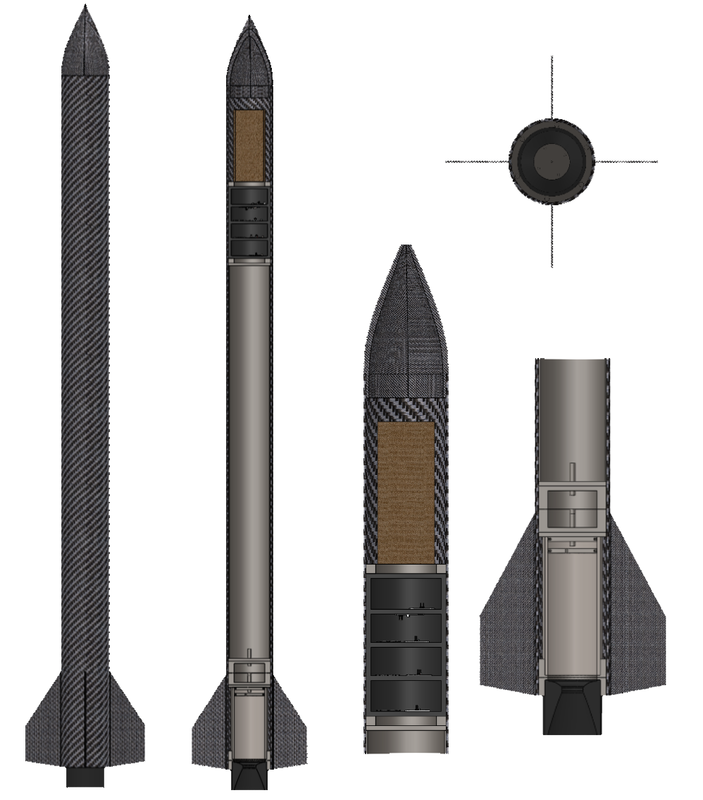 A Hybrid Rocket is a rocket that works with a solid fuel and a liquid oxidizer (the two key parts of a rocket propellant). In our case we are using Nylon 6 as a fuel and nitrous oxide as an oxidizer. The combustion chamber will be made of stainless steel, the nozzle from graphite and the rest of the body will be carbon fibre, with a small portion replaced with clear plastic to allow a camera to film the rocket’s journey. The project allows students to apply what they have learnt to a real life design, not usually possible with large rockets due to their expensive nature. The project also gives students a chance to practice skills that are needed in careers in industry, thus improving their employability. The University of Southampton have kindly agreed to match fund this project from alumni donations to the Fund for the Greatest Need. This means that for every £1 you donate, the University will double it. Your £10 donation will become a £20 donation, and £50 will become a £100. You can help us reach our goal even without donating, by sharing this project with anyone you think would like to support us, either by any of our social media or just chat with colleagues and friends about our project. You will recieve a wristband with the team logo. You will receive a mug with the team logo. You will receive all the previous rewards and an opportunity to sign the rocket. You will receive all the above rewards and a T-Shirt with the team logo. You will receive all of the above rewards and a ticket to be present at the launch of the rocket. For Industrial/Academic supporters - We will print your company logo on our project banner to be displayed at exhibitions of the rocket. For Industrial/Academic supporters - We will display your company logo on the side of our rocket and on our banner to be shown at exhibitions of the rocket. Matchfunding is where you commit to giving £1 for every £1 donated by others. This project is looking for people who would like to make this commitment. You can cap your match amount, and your name or brand will be displayed to everyone who gives to the project. To find out more, please fill out the form and we will be back in touch! If you know anyone who might be interested, please do pass this on to them.